Famous painter Elizabeth Vigée Le Brun recalls, in her memoirs, how a party given by the Duchess Of Mazarin went wrong..
Not long before that event I painted the Duchess de Mazarin, who was no longer young, but whose beauty had not yet faded. 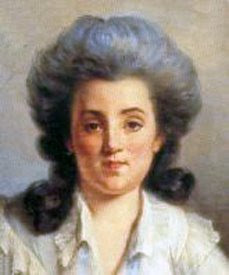 This Duchess de Mazarin was said to have been endowed on her birth by three fairies, Wealth, Duty and Ill-luck. Certain it is that the poor woman could undertake nothing, not even so much as entertaining a party of friends, without some mishap befalling. A number of tales of all sorts of untoward happenings were current. Here is one of the least known: One evening, having sixty people to supper, she conceived the plan of putting on the table an enormous pie, in which were imprisoned a hundred tiny living birds. At a sign from the Duchess the pie was opened, and the whole fluttering flock beat their wings against the faces of the guests and took refuge in the hair of the women, making nests of their elaborately built-up head-dresses. It may be imagined what consternation and excitement there was! It was impossible to get rid of the unfortunate birds, and at last the company was obliged to leave the table, while they blessed such a silly trick.